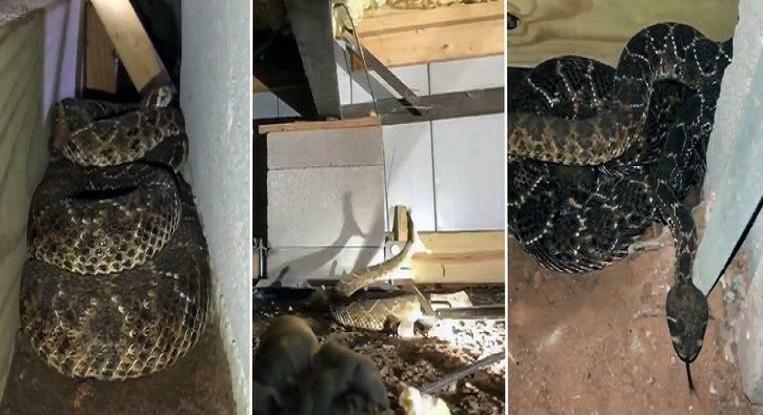 A man from Texas decided to engage a specialized company after seeing “a few” rattlesnakes in the crawl space under his house. But when the specialist arrived, it quickly became apparent that there were many more snakes in the dark room. The company shared special images of the ‘rescue campaign’ last weekend. The residents of the house saw a few snakes in their garden every year but decided to take action when the reptiles were also found to be under the house. One of the residents had seen that when he went into the crawl space to check a cable. He then called Big Country Snake Removal, a company that specializes in snake removal. “The residents didn’t think their house could ever be a hiding place for snakes,” said Nathan Hawkins, the owner of the company. But that turned out to be wrong because when Hawkins arrived on the scene, he saw “immediately” that there were many more reptiles hiding. Armed with a camera, a flashlight and a long metal tong, the expert eventually removed no fewer than 45 rattlesnakes. The largest specimen was more than a meter and a half long, The Washington Post reports. They were Texan rattlesnakes, which are extremely poisonous. The Texan rattlesnake, along with the Diamond rattlesnake, is responsible for most of the deadly snake bites in the United States. However, the majority of bites are cared for on time, which means they are not often fatal. An estimated five Americans die a year on a snake bite. The fact that dozens of snakes had nestled under the house was a surprise for the residents, but no exception for Hawkins. “It was just a workday like another,” he says. The rattlesnakes were released into nature far away from civilization.